The next (Spring ’19) edition of Envoy magazine is now online. You can also sign up to have this quarterly magazine sent home, free of charge! 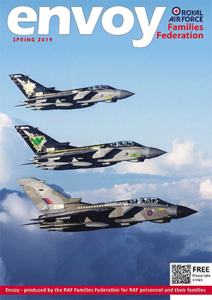 There’s no catch, it’s simply our way of helping to keep you all up to date on life in the RAF. I am still enjoying having so many approaches for articles on new or updated areas of support available to you all as serving personnel or family members. Despite our logo perhaps leading you to believe we are just here for the traditional family, I cannot stress enough that we are actually here for ALL personnel – so if you are single, married, a regular or a reserve, this magazine is published each quarter with you all in mind. An area that is particularly growing in support within the armed forces community is around spousal employment and training. More and more businesses are approaching us to promote that they are forces friendly employers and not only that, much of the pre-employment and business start-up training that is offered is fully funded! So whether you are serving or a family member, life is tough at times and I hope you can use Envoy as a way to find out what’s there for you to tap into. And if what you are looking for isn’t in here – do email me and I will see what I can find. Stan, our accommodation and housing expert shares his latest news. There’s also a pretty crucial update from the Forces Pension Society on the change of rules to the AFPS 05 and AFPS 15 pension schemes – so worth noting and checking you are all up to date on your own personal details. I hope you enjoy the magazine.